A ribbon-cutting in Fresno County today (Aug. 18) marks the opening of the Five Points Solar Park, a 60-megawatt solar power installation built to supply renewable energy to the University of California. The power supplied by the new solar farm represents roughly 14 percent of the total UC system’s electricity usage, and is a key step toward the university’s goal of reaching carbon neutrality by 2025. An additional 20-megawatt installation is set to come online by mid-2017, for a total of 80 megawatts, the largest solar purchase by any university in the U.S. The full output from these two power projects will be going to UC under a 25-year power purchase agreement with project developer Centaurus Renewable Energy. Nearly a quarter of the solar power will go to UC Davis, while the remainder will be shared among the other UC campuses and medical centers served by the university’s Wholesale Power Program. In addition to helping the university reach its goal under the Carbon Neutrality Initiative, the new solar power installations will also provide research and education opportunities for UC faculty, students and staff. Aerial view of the Five Points Solar Farm, Fresno County. In addition to purchased solar energy, the University of California system has grown its onsite solar power production considerably in recent years. A total of 36.5 megawatts of solar photovoltaic technology has been installed across the campuses and medical centers, with an additional 18.3 MW planned within the next year. The UC systemwide goal of reaching 10 megawatts of onsite solar by 2014 was surpassed two years early, and has been more than tripled to date. 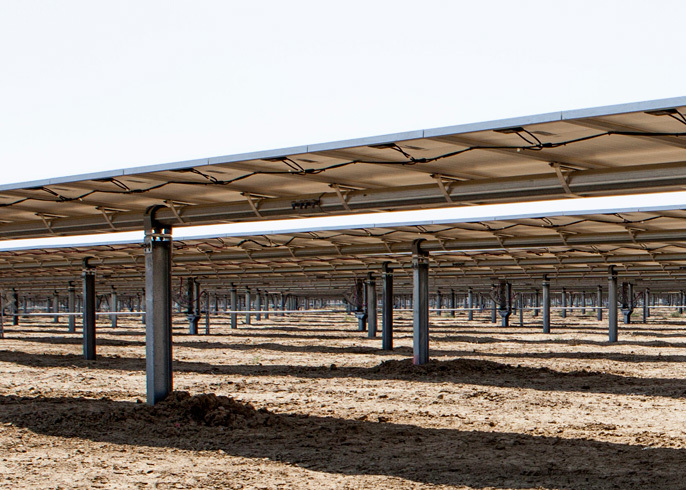 The Five Points Solar Farm is composed of 271,200 panels, covering approximately three-quarters of a square mile of fallow farmland. Clēnera, Centaurus Renewable Energy, Blymyer Engineers (Alameda) and Swinerton Renewable Energy (San Diego) cooperated in the design and construction of the Five Points project.